Pay with credit card or funds from your bank account. Note: If you click on Purchase, you will be redirected to PayPal to complete the order. Once in the PayPal website, you must log into your verified account. If you pay using a non-verified account, we will return the payment. For orders outside Brazil, customers can pay for their Tibia Coins with credit card or bank transfer using PayPal. You must have a verified PayPal account to buy with us. This is a necessary security measure we adopted to prevent scammers. ...and more! You can even sell your Tibia Coins in the market for gold, an indirect but simple way to buy cheap kk. 1. When placing an order, you must inform us the name of any character of your account. 2. 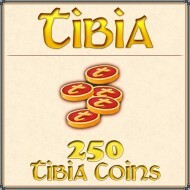 After we confirm the payment was made, we will transfer the Tibia Coins to your character. 3. Once transferred, Tibia Coins are available to all characters on your account and you can access them from within Tibia. Delivery time: 30 minutes to 24 hours. Cheaper than on the official website! And all our coins are transferable!